Physical/ Habitat Description - At 104 acres in size, Johnson's Pond is the largest impoundment on the Eastern Shore. Maximum depth is 11 feet. Johnson's Pond is fed by multiple tributaries, however the two principle tributaries form the lake's north and east forks. These forks form a lower "main pool" which makes up the balance of the lake. The east fork is relatively shallow and featureless with the exception of rooted aquatic vegetation and a small amount of submerged timber. The north fork however, has better depth and more quality habitat including: trees, stumps, docks and rooted aquatic vegetation. In the main pool area many Christmas tree fish "attractors" are located between the old swimming beach and the point north of it. The eastern shore of the main pool near the cemetery has steep banks with many trees in the water, however most of the habitat in the lower third of pond exists on the western shore. This habitat consists of trees, brush and limbs. There are numerous private docks located throughout the pond that provide excellent fish habitat. Fish Species - Johnson's Pond is a Special Bass Management Area. Anglers can find information pertaining to this regulation in the ​Maryland Guide to Fishing and Crabbing​ and also from signs posted at the launching ramp. The special regulations help maintain a well balanced bass/bluegill fishery. Excellent fishing for both these fish species exists within the pond. 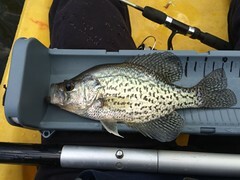 Anglers may also occasionally catch other species including: black crappie, pumpkinseed sunfish, yellow perch, white perch, chain pickerel, brown bullhead catfish and common carp. While not typically targeted by anglers, gizzard shad, golden shiners and chub suckers are also present in the pond and provide an important forage source for the predatory fishes. Restrictions - There is no horsepower limitation for boats on the pond. Camping and swimming are prohibited. History - Very likely, Johnson's Pond was originally established as a mill pond in colonial times. As the utility of old mills gave way to modern technology, other uses were found for the impounded water. In fact, the dam that existed near Isabella street was constructed for the purpose of generating hydroelectric power. The hydroelectric dam washed out in 1933 and the present dam, slightly further upstream, was constructed shortly after 1936. The lake is used now exclusively for recreation, mainly fishing. The Maryland Department of Natural Resources, Fishing and Boating Services​, Freshwater Fisheries Division, manages the sportfish populations in the pond to provide a public angling resource. Fiscal resources for this work comes from fishing license sales and the Federal Aid and Restoration Fund (Dingell-Johnson Act).